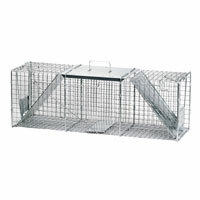 Havahart Live Animal Cage Trap (Large) is available from Parsons! Live catch traps may be used to humanely capture and release opossums. Havahart 1045 (36x10x12) and 1050 (42x10x13) traps are best suited for this type of catch. They should be placed where activity has been seen. Transport opossums at least five miles away for release in a suitable habitat. Avoid trapping during early spring and summer as young may be orphaned by the capture of their mother. Suggested baits: Fish, apples, or canned pet food.